The very first ASEAN-QA study programme site visit out of 23 from April to October began last week at Vietnam National University Ho Chi Minh City. 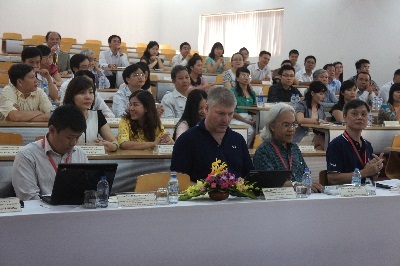 It was directly followed by three further study programme site visits in Vietnam. After a long journey of preparation in three internal quality assurance workshops with accompanying online tutoring, the universities participating in the ASEAN-QA project are being visited by an international team composed of ASEAN and European experts in the field of Quality Assurance and the assessed study programmes. Lead assessors of the project partner ASEAN University Network (AUN) are taking part in the site visits in the function of chairmen. They are supported by two international experts of the assessed study field. To assist the communication between the participating universities and the assessor team, the team will be completed by an EQA officer from the accrediting body of the local country. All study programmes are assessed according to AUN-QA guidelines and criteria, giving the chance to receive the AUN-QA Certificate. The assessor team will visit the university for three days. The external assessors will review the universities’ self-assessment reports coming from the study fields of economics and engineering and conduct the assessment on the basis thereof. The reports have been elaborated over the last one and a half years by the university staff under the tutoring of the ASEAN-QA project. The assessors will now have the chance to review documents on site and to interview university management, teaching and support staff as well as students, alumni and employers in order to have a broader view about the study programme and answer any open questions. In the end of the site visit the experts will report on their evaluation findings and discuss measures how to improve the quality of the study programmes in the future. This will lead to a written assessment report for the study programme and the chance to receive the AUN-QA certificate.